Heart disease is the number one cause of death in America. It takes the lives of about 2,200 people every day. Approximately 84 million people have a cardiovascular disease—whether it is heart failure, heart attack, arrhythmia, stroke, or heart valve problems. But there is one simple way that you can fight back against heart disease: yoga. Beta-blockers and ACE (angiotensin converting enzyme) inhibitors are some drugs commonly used for heart failure, which is a condition in which the heart doesn’t pump enough blood. Fluid retention is known to occur in the lower legs or lungs, which causes swelling or shortness of breath. Fatigue, loss of appetite, and rapid weight gain from fluid retention are known as possible side effects. Chronic heart failure is considered the final stage of heart disease. Yoga is an ancient practice that may transform your downward-facing dog and savasana into a healthy heart. The exercises, postures, and breathing techniques associated with yoga, have been known to treat depression, anxiety, breast cancer, hypertension, and chronic low back pain. The above benefits are why yoga classes are regularly part of my healthy lifestyle, but can yoga treat heart disease, too? Recently, evidence published in the journal Arquivos Brasileiros de Cardiologia says yes, yoga could help treat heart disease. The researchers found two studies that examined the effects of yoga on quality of life and exercise capacity in chronic heart failure patients, which included 29 control and 30 yoga patients. The studies found that exercise capacity increased by 22%, and there was a 24.1% improvement in quality of life of chronic heart failure patients. The Portuguese researchers concluded that yoga should be considered for cardiac rehabilitation programs. The study opens the door for further investigation with larger, randomized, controlled trials. Why might yoga be a solution for heart failure? 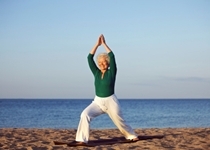 Yoga is known to calm the body and mind, which is beneficial for chronic heart failure patients. It is also considered a great practice for stress reduction. The breathing exercises improve the oxygenation of blood, which increases the efficacy of the heart. I recall another study published in the Journal of Cardiac Failure in 2010. The researchers found that yoga was a safe practice that improved endurance, strength, balance, overall mood, and symptoms in heart failure patients. The study observed 12 stable heart failure patients with an average age of 54, and three-fourths of the group were Caucasian men. Results were measured before and after an eight-week yoga program. The antioxidant coenzyme Q10, arginine, and L-carnitine are supplements known to benefit the heart. The herbal extracts of hawthorn and Terminalia arjuna are also effective treatments for chronic heart failure. Garlic is also known to reduce symptoms of arteriosclerosis, stroke, and heart attack. Patients with heart failure also tend to be low in important nutrients, such as magnesium and vitamin B1 (thiamine), so natural sources or supplements of these nutrients may be beneficial. Heart failure patients are also recommended to quit smoking and decrease their intake of processed foods. Ji, S., “How Yoga Heals The Diseased Heart,” GreenMedInfo web site, October 19, 2014; http://www.greenmedinfo.com/blog/how-yoga-heals-diseased-heart-1. Gomes-Neto, M., et al., “Effects of Yoga in Patients with Chronic Heart Failure: A Meta-Analysis,” Arquvos Brasileiros de Cardiologia October 20, 2014; doi: 10.5935/abc.20140149. Howie-Esquivel, J., et al., “Yoga in heart failure patients: a pilot study,” Journal of Cardiac Failure September 2010; 16(9): 742–749, doi: 10.1016/j.cardfail.2010.04.011. Murray, M., et al., The Encyclopedia of Natural Medicine (New York: Atria Paperback, 2012), 450. “Cardiovascular Disease Statistics,” Johns Hopkins Medicine web site; http://www.hopkinsmedicine.org/healthlibrary/conditions/cardiovascular_diseases/cardiovascular_disease_statistics_85,P00243/, last accessed November 12, 2014. “What is Cardiovascular Disease?” American Heart Association web site; http://www.heart.org/HEARTORG/Caregiver/Resources/WhatisCardiovascularDisease/What-is-Cardiovascular-Disease_UCM_301852_Article.jsp, last updated October 24, 2014. “Congestive Heart Failure (CHF),” Weil web site; http://www.drweil.com/drw/u/ART00688/Congestive-Heart-Failure.html, last accessed November 2, 2014.